How we installed Easy Peasy to a USB Flash Drive using Windows. Easy Peasy is a Remix for Netbooks that is based on Ubuntu. 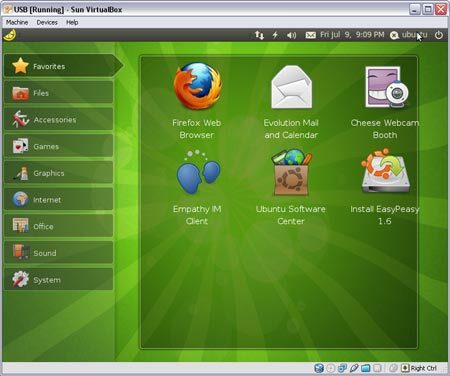 EasyPeasy is an operating system optimized for netbooks. Founded by Jon Ramvi, this Netbook OS offers applications such as Skype, Transmission BitTorrent Client, Pidgin Messenger, Evolution Email, Open Office, and Firefox with Flash, Java and other codecs already installed. Note: This tutorial does utilize the casper-rw persistence feature allowing your to run Easy Peasy Persistently from your USB Flash Drive, saving changes back to the drive and then restoring those changes on subsequent boots. If all goes well, you should now have your very own Easy Peasy Persistent USB Flash Drive to play with. Note: Easy Peasy does not play well with Desktop PC's and Laptops. It was designed for NetBooks.